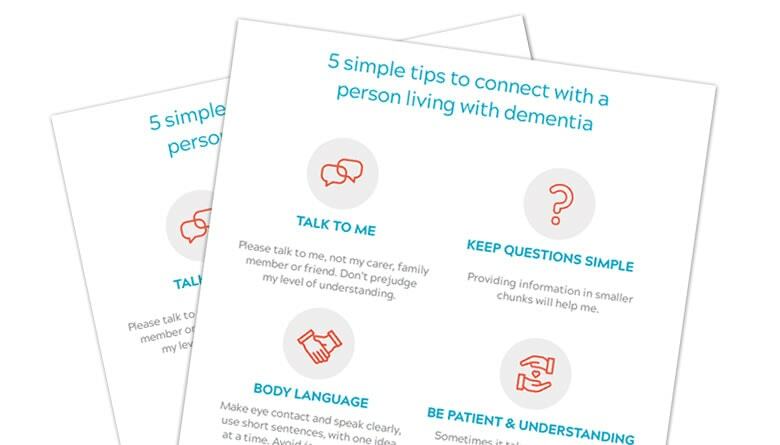 Alzheimer’s WA has five simple tips to help the wider community better connect with a person living with dementia. These suggestions can help those living with dementia feel less alone, with a greater sense of belonging, while being treated with dignity and respect by the community. Please talk to me, not my carer, family member or friend. Don’t prejudge my level of understanding. Providing information in smaller chunks will really help me. Make eye contact and speak clearly, use short sentences, with one idea at a time. Please avoid using jargon. Sometimes it takes a little longer for me to process information and find the right answer. Don’t rush me, allow me time to speak. Less noise and fewer distractions, such as bright lights, will help me to focus.